This burger was the gold standard (so far) for burgers in LA. It was a perfect thing. 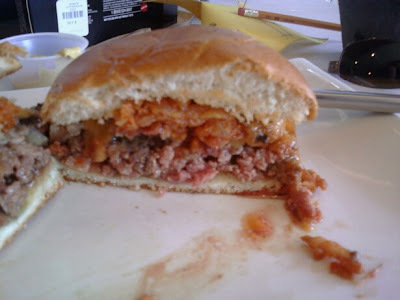 The meat-to-bun ratio was dead on--the meat was expertly, ground, seasoned, formed, and seared. It appeared to be a little on the small side, but it was rich enough that when I finished the last bite, I was left perfectly satisfied. 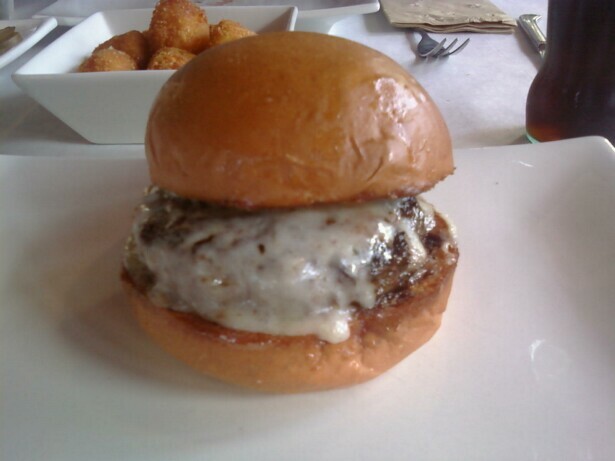 Everyone at Umami Burger was passionate about cheeseburgers, and it really showed. WANT. As you can see, they ground it, seasoned it, and pretty much left it alone. Over-manipulating the ground blend is a recipe for a rubbery burger where the freshly severed protein bonds make complex new ones. That's why croissants are flaky--lots of fat and the dough is very gently kneaded so as not to create long, gluten strands. In this case, what I got was tiny pieces of perfectly seasoned steak. WIN. There is a new location in West Hollywood, which we have yet to try, but if they can maintain the passion and quality, then it will be excellent. Burger Review : Umami Burger....HELL YEAH! Note--The Santa Monica location was sampled and reviewed on 15OCT10, and the excellence and passion were still evident. Now here is a place that takes the art of hamburger making seriously. They don't attempt to drown the burger with sides. The bun is the right size, and the burger cooked to perfection. It is complimented nicely with a variety of fresh ingredients including caramelized onions, oven-dried tomato, beer-cheddar cheese and aged manchego. My favorite part was the assortment of soda drinks available including Mexican Coke and Netherlands Coke Light. I went to the one in Los Feliz (4655 Hollywood Blvd) and it was amazing. The Truffle Burger is hands-down the best burger I've had in Los Angles. I went back yesterday, and it is still amazing.